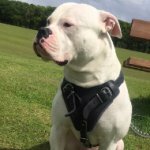 How to Choose a Dog Harness? 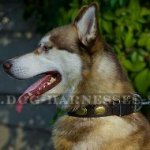 Before buying this accessory for your pet it is worth to examine the abundance of dog harnesses types that exist on the market today and to define for what purpose you buy a dog harness. 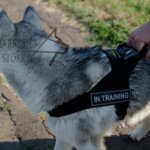 In general, the fundamental harness's difference from a collar (and the main advantage) is that under certain loads (for example, when the dog pulls the leash) there is no compression of the animal's respiratory tracts. 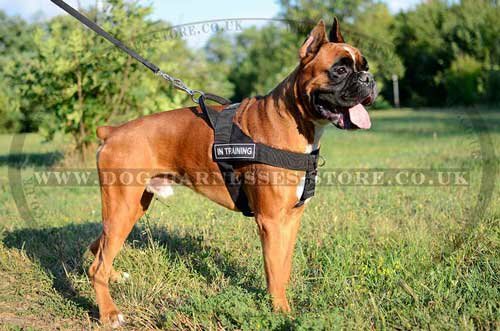 Also the harness being opposite to a collar allows distributing more evenly physical load on musculoskeletal system of a dog. 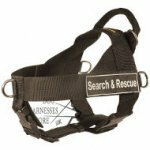 First choosing a harness you should pay attention to the material from which it is made. 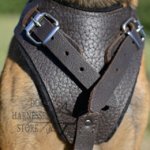 For example, leather harness is very strong and durable, but leather stretches when it is wet and while drying it becomes harder and less durable. 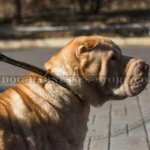 Dog harnesses made of cloth have a number of disadvantages: the cloth is frail and short-lived, it quickly becomes wet and dirty and it is hard to wash it. However there is no magnification ratio in contrast to leather material. Nylon harness does not get wet, it is easy to wash, it has no magnification ratio, lasting and highly durable. 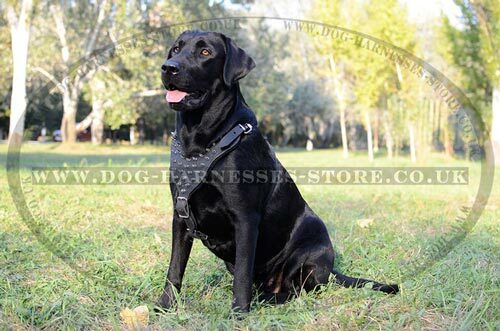 When you purchase dog harness you should pay attention not only to the material, but also on how this harness is stitched, look at the quality of riveting and fastening. The ring and buckle securing requires very careful examination. Ideally the ring must be cast. If the ring is welded, then pay attention to the quality of welding, it directly influences the quality of the product. The manufacturers make on many rings the galvanic influx, which only gives the appearance of welding. Split rings exist too (i.e., the ends of the ring are not fastened). It will be better not to take the harnesses with such rings - they will serve before the first jerk of a large dog. 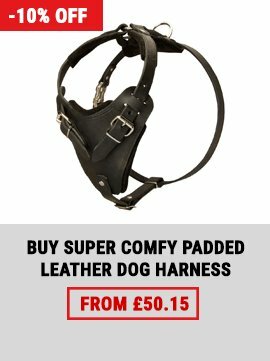 Of course, for small breeds, for which the harness is just an accessory for a walk, the ring quality on the harness does not matter. Toy Terrier will walk both with welded ring and split-ring. But if German Shepherd pulls hard, the split ring will turn to a piece of wire. 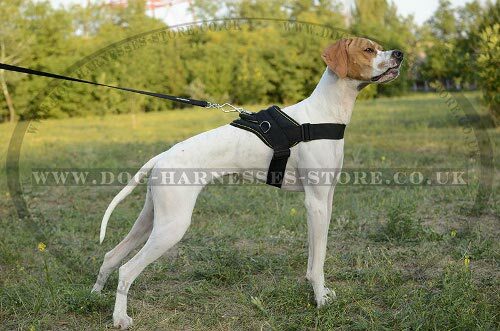 Therefore, some manufacturers in order to stay sure supply the dog harness with two rings. The next rather important point is connected with clasps (buckles). As a rule, for their production metal is used, rare - plastic (for dog breeds). Metal fasteners (buckles) are mainly of two types - traditional (as on usual trouser belt) and quick-release buckle. The last one, incidentally, is the most comfortable and durable. 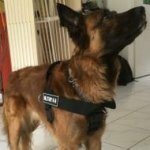 So, you are sure with your choice, but there is a small "but": take into account the age and the breed of your dog, and also the purpose of the harness. 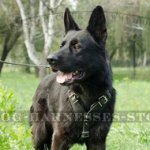 If you are going to work in dog security service then you'll like ordinary harness made of leather or nylon, well stitched and riveted with welded or cast ring. 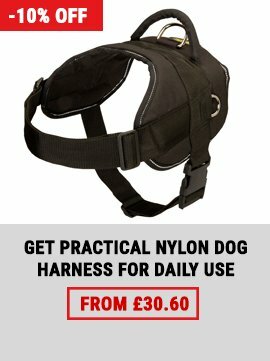 The same harness you can use on walks with the dog. 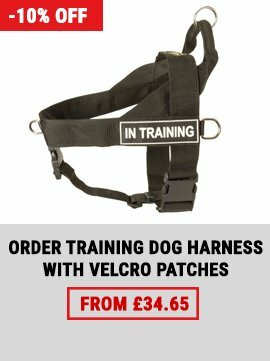 If you want to increase the load for the dog, you should pay attention to the harness for muscles development (pulling, weight pulling harnesses). 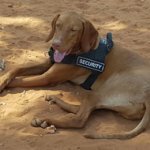 If you are going for tracking with your dog or non-sport towing, you'll need either leather or nylon harness, equipped with three rings - two side and one top that can evenly distribute the load, depending on what your dog makes. For the fans of sled sports (skijoring, etc.) 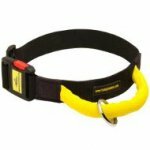 special sled harness or pulling harness will be suited. 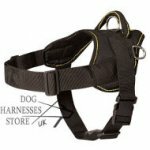 Typically, it is made from durable nylon, its straps are thinner than in "classic" harnesses and it is multifunctional: comfortable, properly distributes the load on the dog's body, it has special attachments that allow fastening the dog to the gear. 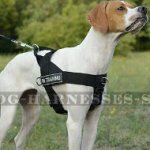 Most lucky are the decorative dogs' owners, because for them it is not important from what material the harness is made. They may be concerned, perhaps, just of the way it is decorated - simple pattern, embroidery or sequins. 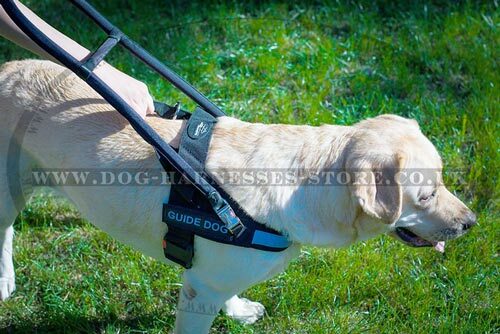 Learn more about dog harnesses. 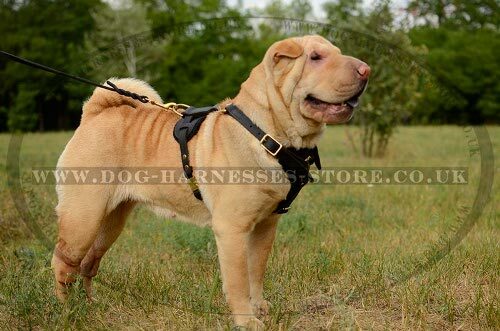 Choose the finest harnesses for large, medium and small dogs in our online store!